Reusing Self-Locking Nut - Safe or Stupid? Do you know when it's safe to reuse self-locking nuts with nylon or fiber inserts? You mean you didn't know you WEREN'T supposed to reuse them? Well, you shouldn't. Not unless, that is, you are following procedures in approved maintenance documents for the aircraft in question. If you fly an experimental aircraft you have no approved maintenance documents, in which case you should follow the guidelines in Federal Aviation Administration Advisory Circular 43.13-1B, Chapter 7, Section 4. What's different between these two nuts? Why is this important? Because these little gems have been implicated in more than a few fatal accidents, including that of The Galloping Ghost, Race Number 177, a P-51D Mustang which crashed into the grandstand at the Reno Air Races in 2011, killing pilot Jimmy Leeward and ten spectators, and injuring 69 others. The NTSB has determined Mr. Leeward likely lost consciousness during a violent pitch up caused by the loss of the starboard elevator trim tab and the failure of the port elevator trim tab, both due to wear in the trim tab mounts. Forensic investigation strongly suggests these problems were exacerbated by self-locking nuts that failed to remain locked after repeated reuse. 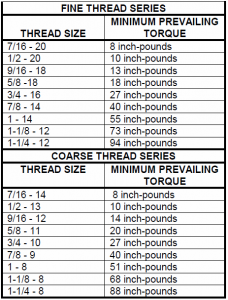 The chart at right lists the minimum prevailing torque standards recommended by FAA AC43.13-1B for reusing self-locking nuts with nylon or fiber inserts. The advisory circular also contains guidelines and procedures for reusing other types of self-locking nuts. 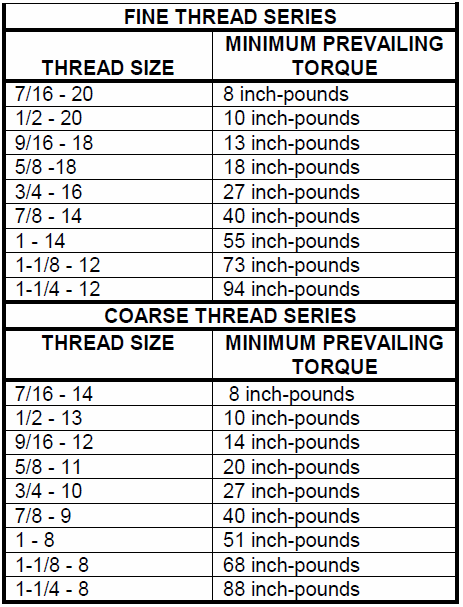 NOTE: The prevailing torque value is that required to thread the nut onto the bolt. It's a measurement to ensure the locking mechanism is working as designed. Do not confuse this with final torque, which is that used to attach a fastener for use in service according to the manufacturer's standards. The bottom line is this: it IS safe to reuse self-locking nuts if you follow FAA guidelines and procedures. It's stupid to reuse them without following these guidelines and procedures. Don't be stupid; the cost of a new self-locking nut is cheap insurance. Click here for more information from the NTSB.